Dishonored 2 is very exciting – not only because there are now two protagonists, each with distinct powers, but also because of the game’s new Mediterranean-style murder box, Karnacka. If you enjoy our videos, why not subscribe to the PCGamesN YouTube channel. 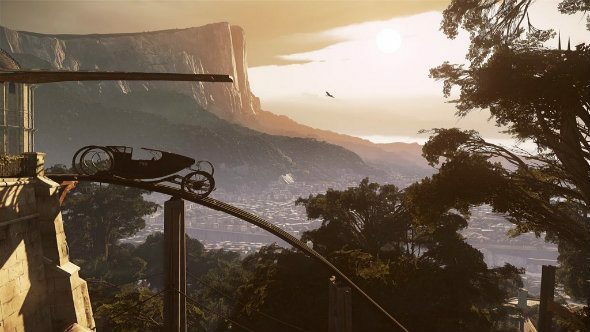 At Gamescom 2016, we spoke to Dishonored 2’s art director,Sébastien Mitton, about creating this gorgeous, sun-soaked playground. Mitton explains how they thought about Karnacka not just from a level design perspective but also as a place – what materials would they use for their buildings? Well they’re near a silver mine and a forest, so take a guess. It’s all in the name of building something cohesive. The new Void engine also makes that art shine more than before, and Mitton thinks it’s unlikely we’ll see a downgrade before release. Have a watch of the video above for all that and more. If you’re a creative video type and you like our stuff, why not come and be the editor of PCGamesN’s YouTube channel. We are hiring and it could be you.